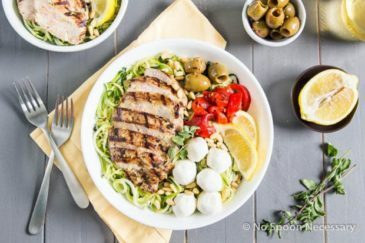 This Healthy Honey Lemon Chicken Quinoa Bowl is easy to prepare and can be on the table in 30 minutes or less! 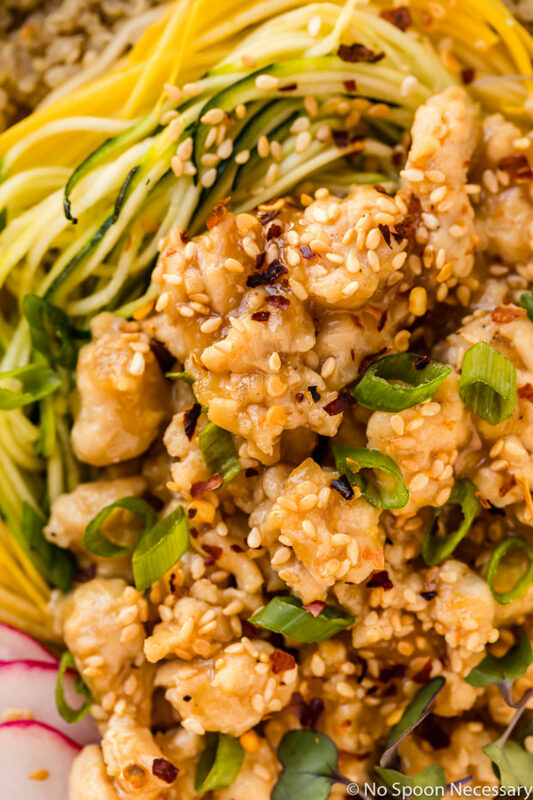 Golden brown, stir-fried ground chicken with a sticky, sweet, tangy honey lemon sauce piled high on nutty quinoa and spiralized veggies. This skinny chicken is absolutely delicious and a great alternative to take out! So, how many of you will be watching the endless streaming 411 of the royal wedding? I’m going to be honest here, I won’t be watching. Did you just look at me sideways? Well, if it makes you feel better, I’m sure on Monday I will look online at what Meghan’s dress looked like, but other than that, I’m not really into it. I guess I’m just not a sideline spectator? That, or I’d much rather soak up some much needed R&R and read a good book. What can I say? I’m boring. Now that we have gotten that imperative, breaking entertaining news out of the way, I’m going to dish dirt on this lemony deliciousness. These bowls are healthy, yet hearty lunch and dinner GOALS, friends. Tender crumbles of savory chicken sautéed with mild shallots, pungent ginger, aromatic garlic, and tossed with a tart, sticky, sweet and sour lemon and honey sauce. 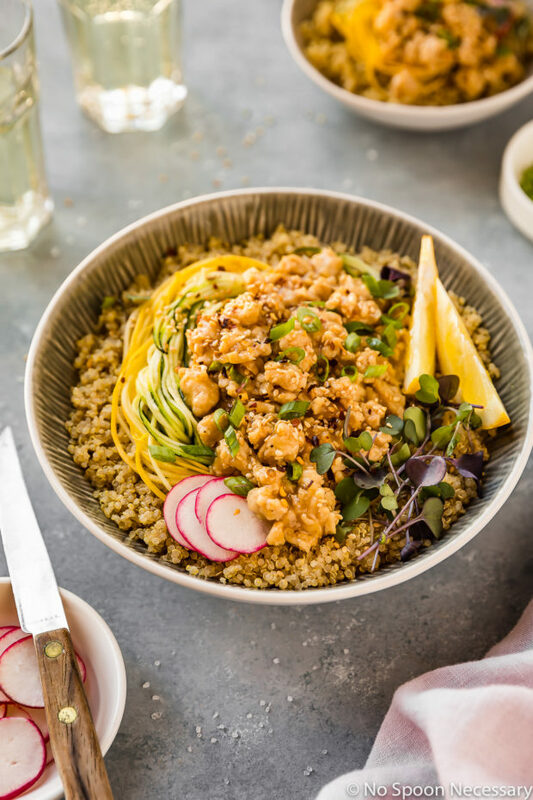 All that savory, sweet chicken goodness gets piled high on chewy quinoa, then topped with crisp, delicate strands of zucchini and squash, and sprinkled with fresh sliced scallions and nutty sesame seeds. This easy quinoa bowl is light, fresh and fabulous! 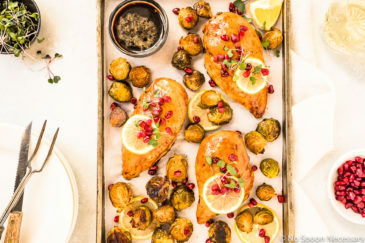 How to make healthy honey lemon chicken? This fully loaded, nutritionally packed, skinny stir fry can be ready and on the table in 30 minutes or less! Plus, it’s incredibly easy to make! We are talkin’, 1-2-3 wam-bam-thank-you-ma’am type of easy. Spiralize (or shred) zucchini and squash while you cook some quinoa. Stir fry diced shallots, add in ground chicken, and then dump in the super simple sauce. Let that simmer away until the sauce is thickened and the chicken is glistening and coated. 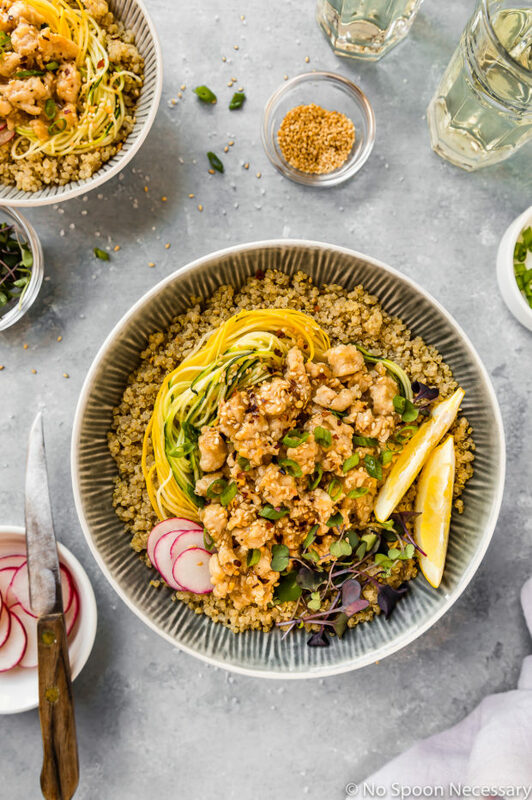 Assemble it in a bowl (or plate) and then chow down on this seriously scrumptious healthy honey lemon chicken quinoa bowl. What is in honey lemon chicken sauce? The honey lemon sauce for this healthy chicken stir fry is super simple to prepare and only requires seven pantry staple ingredients! Using fresh lemons to make the sauce is highly recommended! Since lemon is main component of the sauce, using fresh lemons (versus bottled lemon juice) will produce the brightest, most flavorful sauce. Also, if you are a huge fan of lemon, I highly suggest you increase the lemon zest in the recipe from the zest of 1 lemon to the zest of 1 ½ – 2 lemons. Lemon zest holds the essential oils of the lemon and therefore, it is filled with PURE lemon flavor. The recipe below calls for ground chicken, however you can substitute ground turkey if desired! To keep things extremely healthy and light, I used lean, all white meat ground chicken. With that said, the plain packaged combination of white and dark meat ground chicken will pack the most flavor and produce moister chicken. The recipe below is extremely flexible, and you should use whatever variety of ground chicken, or turkey, you like! I highly encourage you to squeeze fresh lemons for the juice required in the sauce. Bottled lemon juice does not taste as bright and lemony as fresh lemon juice. As well, if a strong lemon flavor is desired, increase the amount of lemon zest in the recipe from 1 lemon to 1 ½ -2 lemons. While I served my healthy honey lemon chicken as a quinoa grain bowl, the stir-fry chicken is also delicious served as a lettuce wrap! Simply nix the quinoa and pile the chicken into bibb, iceberg or romaine lettuce! Until next week, friends, cheers – to healthy bowl goals FOR LIFE. 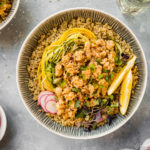 This Healthy Honey Lemon Chicken Quinoa Bowl is easy to prepare and can be ready in 30 minutes or less! 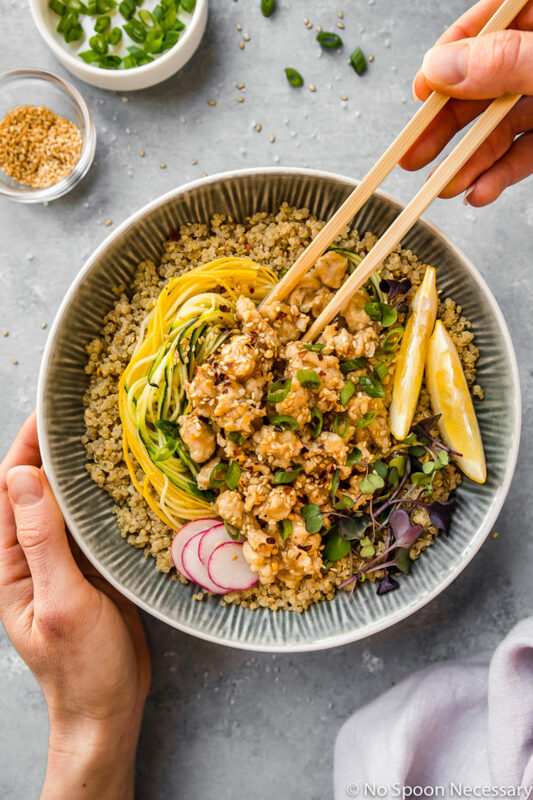 Stir-fry ground chicken with a sticky, sweet, tangy honey lemon sauce piled high on nutty quinoa and spiralized veggies. This skinny chicken is absolutely delicious and a great alternative to take out! Make the sauce: In a small bowl, whisk together all the ingredients for the sauce. Add in a teaspoon of sriracha or a pinch of red pepper flakes for heat, if desired. Set aside. Stir-fry: Heat the oil in a skillet over medium-high heat. Add in the shallot and cook, stirring occasionally, for 2 minutes, or until softened. Add in the chicken and season generously with salt and pepper. Saute, breaking up any lumps with a wooden spoon, until almost golden brown, about 3-4 minutes. Add in the garlic and ginger. Cook until aromatic, about 1 minute. Add in the sauce and bring to a rapid simmer. Reduce heat and simmer until the sauce is slightly thickened, about 4 minutes. Taste and adjust for seasoning with salt and pepper. To serve: Divide the lettuce and quinoa between serving bowls and add the chicken. Top with shredded vegetables and garnish with sesame seeds and green onions. Enjoy! The recipe calls for ground chicken, however you can substitute ground turkey if desired! To keep things extremely healthy and light, I used lean, all white meat ground chicken. With that said, the plain packaged combination of white and dark meat ground chicken will pack the most flavor and produce moister chicken. The recipe below is extremely flexible, and you should use whatever variety of ground chicken, or turkey, you like! I really love what you have been cooking and eating here, Looks so nice and healthy. I wasn’t very interested in the royal wedding but I looked at the pictures today and it really was beautiful. Everyone looked so happy in the pictures – it was a nice change from all the gloom and doom you usually see on the news these days. As I mentioned on IG, this bowl looks so healthy! Love a good, healthy quinoa bowl, Cheyanne. Hope you are having a great weekend! Looks so nice and healthy. Fast, easy, healthy, and delicious? Sign me up! Ok. So first off, YES I’ll be watching! I watched Lady Diana and Prince Charles tie the knot, watched bits and pieces of Kate and Williams’s, but Prince Harry is so adorable and I loved Megan on Suits, so I’ve got to watch! Now, this bowl. How did you know, with bathing suit season quickly approaching, that I’d be looking for a lip smackin’, satisfying skinny chicken dish! And I love quinoa too! You’re coming through for me in a big way Chey! Sounds so easy and that sauce…yes!! Love this one. Your photos! Beautiful! I’m with you — I won’t be watching but I will be interested to see what Megan will be wearing. That’s the fun part. 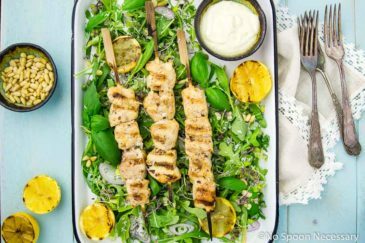 🙂 These lemon chicken quinoa bowls look fantastic too. I’ve been into Mary’s ground chicken so I have some in the freezer. I’m totally trying this! Lovely dish, Cheyanne! The honey lemon flavour is always fabulous. And as for the royal wedding, since Canada is part of the Commonwealth, we are probably more interested than most (since the royals are on some of our money 😉 So I’ll be watching! I’m gonna be real honest here. I can’t watch the royal wedding because I SOOOO wanted to marry Prince Harry and I’m afraid I’ll cry that I’ve lost the chance. I’d be a very good royal–I’ve even spent time practicing my wave. Alas…I’ll. join you on Monday looking at the pics of Meghan’s dress though :). As for this beautiful dish, I could definitely eat a huge bowl (or two). And I could probably drink the sauce with a straw! 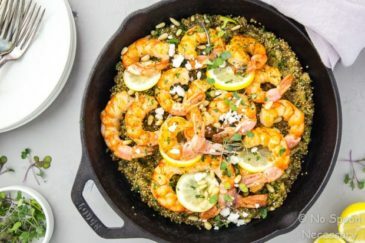 Anywho, this quinoa bowl looks incredible! We’re in Argentina and have basically been stuffing our faces with meat and wine and I am SOOO ready for some light meals – especially when they sound this delicious! LOL, I didn’t even know there was a royal wedding happening. So no, I won’t be watching. I am loving this recipe. The flavors sound so amazing, and I’m a sucker for lemon so I will be zesting away! Always in need of healthy weeknight dinners. in between my ridiculously unhealthy weekend cooking! I love protein loaded dishes like this…really love what you have been cooking and eating, Chey.